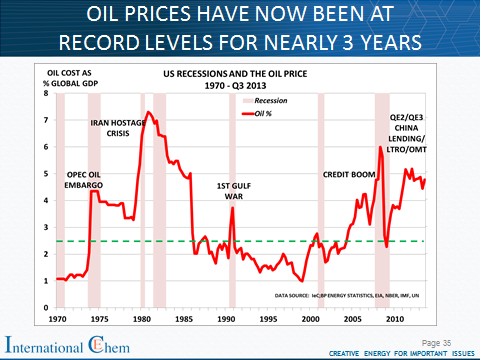 Home Blogs Can oil prices stay at $100/bbl forever? Can oil prices stay at $100/bbl forever? Sometimes the blog’s mind goes back to its happy days in Houston, Texas, when it set up and ran ICI’s feedstock and petchems trading office. And it thinks through the factors that it would have considered when deciding whether to buy, sell or sit on the sidelines. 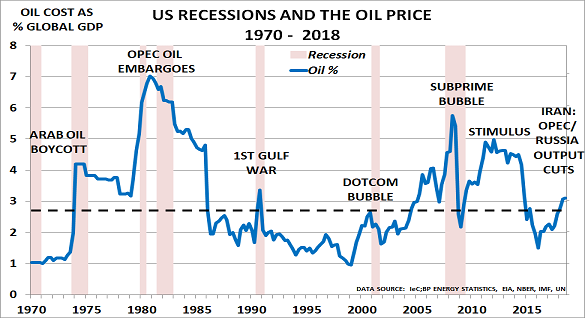 The memory came back during last week’s lively ACS webinar, when it used the above chart to respond to questions about what might happen next to oil prices. It seems that everyone now believes that oil will remain at $100/bbl forever. This is certainly the forecast being made by the management teams with whom the blog has been working in recent months. And it is also the forecast of every investor with whom it has discussed the issue. What is happening to demand? What is happening to supply? What is happening to inventory? When it has answered these questions in its mind, it will then look at a chart of price movements. The reason is that day-to-day trading in most commodities is dominated by so-called ‘technical trading’, which seeks to understand market sentiment by looking at the patterns being formed by prices. This process has in the past always served the blog well. Its trading made good money for ICI in Houston, and it still seems logical today. But “seems” is the operative word, as this approach has been a licence to lose money since central banks began their quantitative easing in 2009. Demand growth remains weak; supply is increasing rapidly; inventories are generally at comfortable or record levels. Yet prices continue to stay around the $100/bbl level. Equally important, one might have thought, is that history shows oil normally costs around 2.5% of global GDP (the green line on the chart). When costs rise above this level, then recession usually follows (the pink shaded area). Today, of course, it is nearly double this level, as it has been since 2011. This highlights the key issue from the blog’s viewpoint, namely affordability. People only have a certain amount of money to spend – especially today, when wages are actually falling in real terms (adjusted for inflation) in most parts of the West. And those in emerging economies have very little money to spend by comparison, as their incomes are very much lower to start with. We have, of course, been here before, during the early 1980s. The reason is that oil markets are relatively easy to manipulate if you are a major player, and prepared to ‘do whatever it takes’. Thus Saudi Arabia held prices high by cutting back its production level from 10.3mbd in 1981 to just 3.6mbd in 1985, before deciding it would play this game no longer. Prices then promptly collapsed from $30/bbl in November 1985 to $10/bbl by July 1986. This, of course, reminds us of the ‘golden rule’ that supersedes all the others set out above. In the 1980s it was ‘Don’t fight Saudi Arabia’. Until they gave up, you would always lose by betting against them. Today’s motto is, of course, ‘Don’t fight the US Federal Reserve and the central banks’. They have spent $33tn in their vain efforts to boost demand in today’s ageing society. And, of course, they are supported by all the major producers, who are happy to benefit from today’s higher prices for as long as possible. That is a lot more firepower than anyone else can command. But does it mean they can win, where Saudi failed before? Can they really continue to print enough money to support demand enough to keep prices high? This, of course, is the same question that stock market investors keep asking themselves, as the correlation trade between oil and financial markets continues to roll. Most people, understandably, think that they probably can. And recent history suggests they have won so far – the Fed launched QE1 at the end of 2008; QE2 began immediately markets fell in the summer of 2010; Operation Twist in the autumn of 2011; and finally QE3 in September 2012. And each time, prices stopped falling as the money surged through the financial system in search of a home. So far, the Fed’s balance sheet has risen to $4tn as a result (25% of GDP). But can it continue to do this forever? The market, and everyone with whom the blog talks, think “yes”. And certainly prices rose yesterday despite the US Energy Information Agency’s forecast that US will be the world’s largest oil producer in 2015, and will revisit 1970’s record output of 9.6mbd by 2016. But where will all this oil go, wonders the blog? It is not sure that the Fed and the central banks really can continue to support prices forever. And it suspects that if they try, they will find like Saudi in 1985 that supply simply floods out from everywhere. US oil supply, for example, has grown 18% in just the past year, whilst US exports of gasoline, diesel and fuel oil are at record highs.. Thus it would argue that oil prices, like population forecasts, may not be as certain as we all imagine.